Anansi has just discovered a sandy hill of brown termites. “I’ll use these somehow,” 10-year-old Anansi says wonderingly as he shows the glossy National Geographic to the five other 10 to 12-year-olds in the after-school poetry and collage class at the Woodland Pattern Book Center, a nonprofit literary center on the 700 block of Locust Street. A rainforest tree frog, the Leaning Tower of Pisa, and a tail-flapping whale are just a few of the other images that are being pondered for use in collages. Max, a stocking cap clad 10-year-old who attends Fratney School, looks for aquatic life and brightly colored blue hues to go with the rest of his work. “The kids just take to the collages,” says teacher Maureen Kane during a spare moment. Kane, a graphic artist, has been co-teaching the course for three years with writer Stacey Sievert. “I’m impressed by their creativity and freedom — as adults we immediately think of boundaries, but here, a lot of good things happen even if it’s by accident.” Halfway through the class, Sievert heads the poetry segment. Hunkered down on the floor away from the collages, everyone closes their eyes and listens to Sievert whisper some possible writing themes. She instructs them not to worry about writing for anyone’s approval, and later several students volunteer to read their own and others’ works about issues they care about and leaders they admire. “I try to feel the group out,” Sievert, says afterwards. “I listen really closely while they are with their collages and try to figure out who they are and what they are talking about.” Towards the end of the six-week workshop, which meets for 75 minutes after school on Thursdays, the class will use the digital lab at the center to superimpose their poetry onto their collages; the results will be glossy posters that they can take home. In addition to the poetry collage course, Woodland Pattern is also currently hosting another workshop, “Pre-Teen Poetry ‘Zine,” for 9 to 12-year-olds. Students in this workshop help create an illustrated poetry anthology, or ‘zine. Starting on April 22, the center will be hosting a different six week workshop Thursday afternoons from 4-5:30 p.m., Body and Form: Creative Writing and Movement for Teenagers, in which the instructor will use yoga in conjunction with creative writing. For the week of June 21-25, Woodland Pattern will be offering Woodland Creatures Poetry Camp for students entering the 6th to 12th grade. According to Woodland Pattern’s Educational Coordinator, Peter Whalen, students will spend mornings in writing workshops with instructors and guest artists and will take field trips in the afternoons. Past trips have included visits to Boerner Botanical Gardens and the Milwaukee County Zoo. “And there are scholarships available for the poetry camp,” Whalen said. The cost of the summer camp is $150/$145 for members, and the workshops for the poetry collage, ‘zine, and the yoga-based Body and Form classes range from $50-65. Woodland Pattern, said Whalen, accommodates students in the after-school classes by providing a limited number of scholarships. “We really want to be involved in the community and to improve the writing skills of students in our neighborhood,” he added. Walen pointed to budget cuts at local schools that have resulted in loss of staff and funding for arts programs — he views the youth workshops as a means through which Woodland Pattern can help fill this gap and aid students who otherwise may view writing as a “chore.” “It’s also just a good opportunity for students to experience writing in a different, artistic setting,” Whalen said, pointing to the colorful paintings in the center’s gallery. 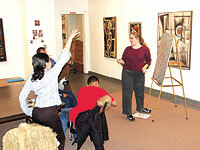 For more information on both youth and adult workshops at the Woodland Pattern Book Center at 720 E. Locust St., call (414) 263-5001 or go to http://www.woodlandpattern.org/. In addition to financial donations, Woodland Pattern accepts potential collage material, including wallpaper samples, poetry books, and colorful magazines.